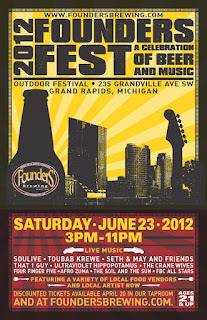 Founders Brewing Co. is expecting 5000 or more beer and music lovers to gather on Saturday, June 23, for their 5th annual Founders Fest, an outdoor festival in downtown Grand Rapids that celebrates two of the things the brewery loves the most: beer and music. From 3-11pm, Grandville Avenue between Cherry and Bartlett will be blocked and the grounds of the brewery secured for the festivities. A wide range of musical talent will be rocking out at this year’s Founders Fest, with national act SOULIVE coming in from Brooklyn, NY, to headline. Other performers include Asheville’s TOUBAB KREWE, whose latest album is on Nat Geo Music; Michigan folk favorites SETH & MAY AND FRIENDS; one-man band THAT 1 GUY out of Las Vegas; the locally sourced improvisational progressive rock band ULTRAVIOLET HIPPOPOTAMUS; and Grand Rapids indie-folk outfit THE CRANE WIVES. Hometown rockers FOUR FINGER FIVE and the 12-piece African funk group AFRO ZUMA join local favorite and SXSW sweethearts THE SOIL AND THE SUN and a super-group of Founders employees, the FBC ALL-STARS, to round out the entertainment lineup. This year’s event will again feature local food vendors, including The Cottage Bar and the Pita House, as well as a Local Artists Row, which showcases the various works of some of the area’s finest artists and designers. There will be other strolling surprise entertainers sprinkled throughout the day. Founders Fest is a celebratory “thank you” to Grand Rapids and West Michigan for making Founders what it is today. Founders Brewing Co. has been a part of the Grand Rapids scene since 1997 and has grown its brewing tradition from modest beginnings to most recently being rated the second best brewery in the world, for the second year in a row. Discounted tickets will be available starting April 20 at the Founders taproom, as well as online, via foundersbrewing.com through our friends at brownpapertickets.com. Tickets are $20 for the general public, and $15 for 2012 Mug Club Members (show your 2012 Mug Club ID Card to receive discount). Day-of tickets will be available at the gate for $25. The event is limited to ages 21 and older.